What does a writer have in common with a shoe salesman? A shoe salesman is less free, but more useful to society. 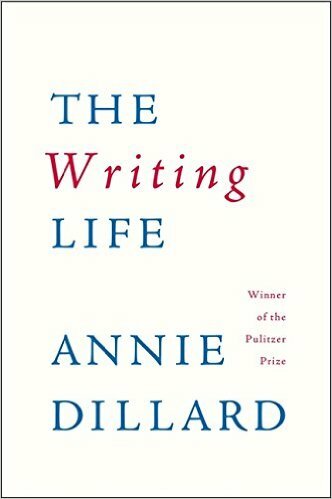 Annie Dillard begins her brilliant writing guide with advice that is hard to accept. All writers, she says, must discard much of what they write. What this means for a writer is that you can spend days working, working hard, and still have nothing to show for it. Suddenly, your writing life can seem like a giant waste of time. Because then what are you spending your days doing, anyway? Sure, writers have the freedom to shape their days. You can work in your pajamas, in your kitchen, at a coffee shop. But this freedom comes at a price. There’s no doubt that a writer’s day can feel immensely, soul-crushingly trivial. When I am writing, it’s with the full knowledge that much of what I write will end up in the trash, or be deleted into nothingness, as if it never existed. But there’s always the hope that this will get me to where I need to go. The words will come, and I will write pages that I don’t need to throw away. I will keep going until I have finally approached a semblance of shape, of a book. Hurray! I have written stuff, page after page of writing. My book is finally coming together. Now, Dillard says, is the time to discard the beginning. Wait, what? Yes, You read that correctly. The beginning of the work must be discarded. It is in those pages that you were laying your tracks, your line of words, and following to see where they lead. Then, when you have been led somewhere good, you must cover your tracks. This is the courage that writing a good book requires of us. To “tie off the umbilical cord”. Dillard urges us to be brave, and discard those parts. They were for us to get to where we needed to go and now, we cannot keep them simply because so much of our time was spent on the work, or because we have read it so many times that it now seems inevitable, so familiar that we feel it must be retained. Just put yourself out of your misery. You will write a better book for it. Being a writer is hard, but we already know that. And like any skill, it takes practice; a lot of what we write is practice. (Musicians practice all the time, and never think of it as waste.) A lot of our writing has to do with giving ourselves room to develop, to grow, to experiment. To follow a thought or an image. Sometimes it’ll work and sometimes it won’t. And when it doesn’t, we need to be able to discard it from the final printed page, even though it took so much to get it out in the first place. The reader doesn’t need to see this practice, the lines we followed. Everything we write won’t be published, and we shouldn’t be writing everything as if it will be published either. Sure, it’s hard enough getting the words out sometimes, let alone discarding pages like it was nothing. But think of it like this – that’s what the writing process is. Word by word, every line that much closer to what you want your book to be. Writing is a slow process; it is one step forward, two steps back. The key is to keep going. Writing a book, as Dillard says, is “interesting and exhilarating. It is sufficiently difficult and complex that it engages all of your intelligence. It is life at its most free.” Let’s get back to work.